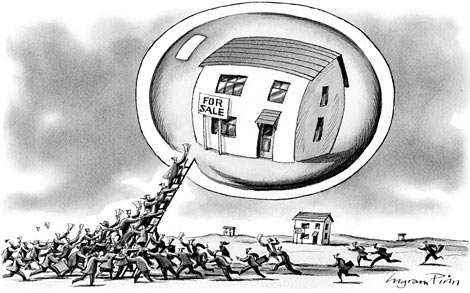 Housing bubbles proceed in fairly predictable stages. Stage One is long and (initially) slow, fueled by excess central bank money creation or foreign demand or some other source of liquidity that encourages large numbers of people to buy houses. At first, sellers remember the peak prices from the previous bubble and aren’t willing to sell at anything less than that (in finance-speak, they’re “anchored” at the highest price they could have gotten last time around). So demand initially outstrips supply, causing home prices to rise, slowly at first and then explosively as increasingly-desperate buyers become willing to pay any price while mortgage lenders, seduced by fat fees and confident that they can securitize and offload any kind of dicey mortgage, lower their standards to include pretty much the whole of society.